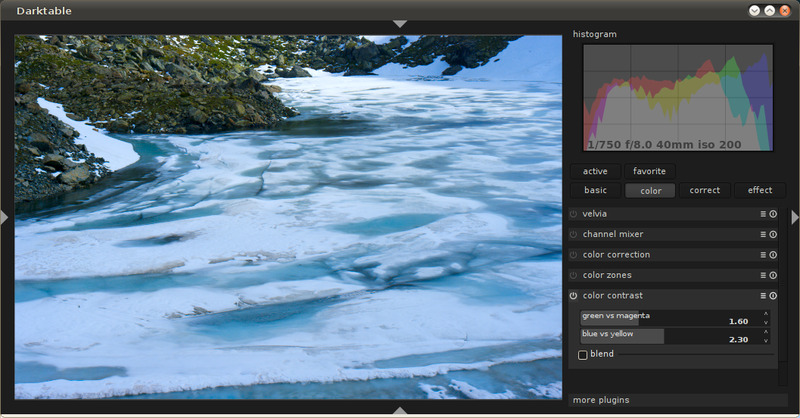 As many aspiring photogrpahers, I want to adjust color curves in Lab color space. Changing steepness of a* and b* curves is a popular method to boost color contrast in the image (see Dan Margulis books or this summary). It works best for abstract and some of the landscape photography. There are few open source solutions which allow to do it. Gimp can decompose an image into three Lab layers, but it doesn't have an interactive preview, and internally Gimp represents color with only 8 bits per channel. There are also Delaboratory and Lab curves for Gimp, but they don't fit my workflow very well. These days I do almost all my photo processing in Darktable, and wanted to be able to adjust color contrast there without using another program (Delaboratory) everytime. I knew that Darktable uses floating point representation for color channels and works in Lab already. Then I noticed, that basic Margulis' recipes are about “straight” symmetric curves anyway. So if there are only two degrees of freedom, then even a simple plugin with two sliders can be very useful. And so wrote my first plugin for Darktable, and named it “Color contrast”. This plugin allows to control the effect with only two sliders. They have user-friendly labels “green vs magenta” and “blue vs yellow”. So this plugin can be used even by users who do not know anything about Lab. Technically, two values which the sliders control are the tangents of straight symmetric curves for the transforms in a* and b* channels respectively. Update: The plugin has been pushed to master branch of the Darktable git. See how to install it. Or you may get the patches from the (rebasing) branch custom of my git repository: darktable-custom.